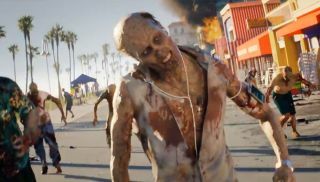 Dead Island 2 is currently in development by Spec Ops: The Line studio Yager Development, it was confirmed today at Sony's E3 press conference. The trailer above doesn't show anything in the way of actual in-game footage, but it does set the scene for the forthcoming co-op zombie basher, which is due Spring 2015. Curiously, Dead Island 2 will not be set on an island, and there aren't any plans to rename it Dead Continent either. Departing from the game's traditional island setting, the Unreal Engine 4 powered title will take place in California. According to a release sent by publisher Deep Silver, California has become "a bloody paradise for those who refuse to leave their homes, and an action-packed playground for renegades who seek adventure, glory and a fresh start." The game will feature seamless eight-player drop-in, drop-out co-op. Expect to see a bunch of 'never-before-seen' weapons, and real life locations like Venice Beach and the Golden Gate. For more on E3 2014 check out our handy guide to the first day , which featured game announcements galore.